Twist Fall 2010 is UP! Norah and I both have designs in this issue. It’s my first design for Twist and I couldn’t be more excited about it! Norah designed a pullover called Orange Pop, a really fun turtleneck with quirky details. Using Mary-Heather’s exact measurements and fun personality as inspiration, Norah designed a figure-flattering Ultra Alpaca sweater with lots of waist shaping, reverse Fair Isle and a unique pointed turtleneck collar. I designed a dress called Kiloran. It was an absolute joy to work on from the initial inception to the agonizing wait for the debut issue. In the past couple of years I have really tried to figure myself out as a designer. One item or shape I return to again and again is the dress. I think I like the design challenge of making something that won’t stretch out of shape or look shapeless and unflattering. Two things that are vitally important are yarn choice and the judicious use of seams. 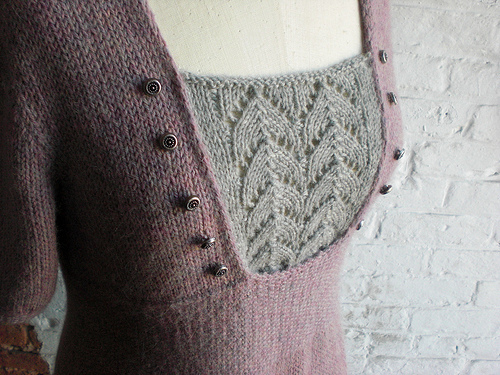 I am all in favor of knitting things in the round and avoiding seams when possible, but in certain situations, a seam or a bound-off edge can add much-needed structure. 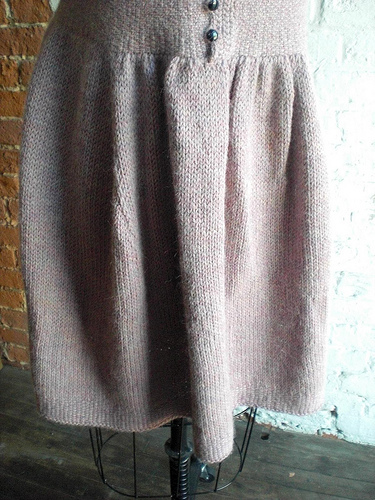 Kiloran features several seams and where it makes sense, easy circular stockinette. The knitting seemed to zip along, I’m not sure if it was because I was working with the very well-behaved 3-ply Ultra Alpaca in a new shade that I adore (Candy Floss Mix is a strange, evocative dusty pink) or if it was because I had discovered my new favorite film while working on the dress. “I Know Where I’m Going!”, directed by Michael Powell and Emeric Pressburger in 1945 is funny, wistful, gorgeous and endlessly entertaining–I finished the dress in under two weeks time, unusual speed for me that I completely attribute to Powell and Pressburger’s masterpiece. The Kiloran dress is lovely. Thanks for sharing the mood board; it’s fascinating to see the genesis of your beautiful design, Princess Anne of Battenberg in particular! Such wonderful work from both of you!! Huge congrats! And I can’t say it enough – I *loved* wearing Orange Pop! First – what an honor to get to model one of Norah’s designs. Second – that sweater is freakin’ MAGIC! Loved it and the second I put it on I felt like I looked like a million bucks. 🙂 YAY! it’s a gorgeous design, so romantic!! Love it. I love this dress! What a beautiful design! When I saw the photo of the back of this dress in the Twist fall collection, it stopped me and my jaw dropped. Oh my, so pretty. Then, the photo of the front, wow! Stunning! It is so romantic and and beautiful. I love that you’ve shown us your inspiration board and a peak into your creative process, thank you. Love the sweater AND the dress! The name Kiloran, as well as the design is just fabulous, and oh so flattering. I can fully understand the inspiration coming from the wonderful film, I Know Where I’m Going! It’s one of my favorites, as well! It was considered by Hollywood of the 1940’s, one of the best screenplays ever written. If you haven’t seen many of the Powell and Pressburger films, I highly encourage Black Narcissus, The Red Shoes, and A Matter of Life and Death. I’d love to see what you’ll create watching those gems! Thank you both for continuing to make knitting a lovely journey for us all! Thanks for the heads up about that great site! I’ll be anxious to find out how you like the others. The Life and Death of Colonel Blimp is also a great one with Roger Livesey and Deborah Kerr working so well together! The color in the Red Shoes is so lavish that I bet it inspires you! Have fun watching and creating! 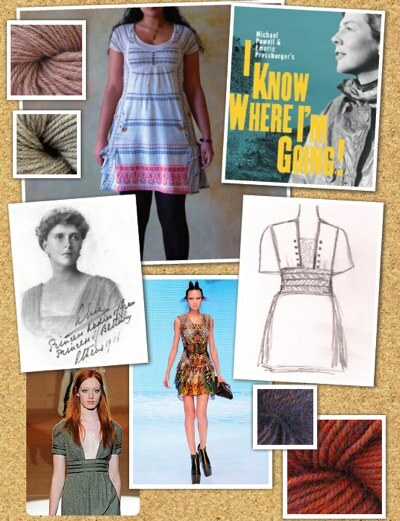 Next article New England Knits!